1. Floor and Ceiling Runners — For use with Item 5. Channel shaped, attached to floor and ceiling in two rows, a min 1 in. apart, with steel fasteners spaced 24 in. OC. Runners fabricated from min No. 25 MSG galv steel, 1-1/4 in. wide and 2-1/2 in. deep. 1A. Floor and Ceiling Runners — (Not Shown) — As an alternate to Item 1, For use with Items 5, 5A, 5B, or 5C - Channel shaped, attached to floor and ceiling in two rows, a min 1 in. apart. Runners fabricated from min No. 20 MSG galv steel, 1-3/16 in. wide and 2-9/16 in. deep. 1B. Framing Members* — Floor and Ceiling Runners — (Not Shown) — As an alternate to Item 1, For use with Item 5 - Channel shaped, min 2-1/2 in. deep fabricated from min 0.018 in. thick galv steel, attached to floor and ceiling with fasteners 24 in. OC. max. 1C. Framing Members* — Floor and Ceiling Runner — (Not Shown) — As an alternate to Item 1, For use with Item 5 - proprietary channel shaped runners, min 2-1/2 in. deep with 1-1/4 in. long legs fabricated from min 0.018 in. thick galv steel, attached to floor and ceiling with fasteners spaced 24 in. OC max. 1D. Framing Members* — Floor and Ceiling Runners — (Not Shown) — As an alternate to Item 1, For use with Item 5 - Channel shaped, min. 2-1/2 in. deep, attached to floor and ceiling with fasteners 24 in. OC. max. 1E. Framing Members* — Floor and Ceiling Runner — (Not Shown) — As an alternate to Item 1, For use with Item 5 - proprietary channel shaped runners, min 2-1/2 in. deep with 1-1/4 in. long legs fabricated from min 0.018 in. thick galv steel, attached to floor and ceiling with fasteners spaced 24 in. OC max. 1F. Framing Members* — Floor and Ceiling Runner — (Not Shown) — As an alternate to Item 1, For use with Item 2G and Item 5 - proprietary channel shaped runners, min 3-1/2 in. deep with 1-1/4 in. long legs fabricated from min 0.018 in. thick galv steel, attached to floor and ceiling with fasteners spaced 24 in. OC max. 1G. Framing Members* — Floor and Ceiling Runner — (Not Shown) — As an alternate to Item 1, For use with Item 2H and Item 5 - proprietary channel shaped runners, min 2-1/2 in. deep with 1-1/4 in. long legs fabricated from min 25 MSG (0.018 in. min. bare metal thickness), attached to floor and ceiling with fasteners spaced 24 in. OC max. 1H. Framing Members* — Floor and Ceiling Runner — (Not Shown) — As an alternate to Item 1, For use with Item 5 - proprietary channel shaped runners, min 2-1/2 in. deep with 1-1/4 in. long legs fabricated from min 0.020 in. thick galv steel, attached to floor and ceiling with fasteners spaced 24 in. OC max. 2. Steel Studs — For use with Item Items 1 and 5. Channel shaped, supplied with cutouts, friction -fitted into floor and ceiling runners and spaced a max 24 in. OC. Studs cut 1/2 in. less than assembly height and evenly staggered between the two rows of floor and ceiling runners. Studs fabricated from min No. 25 MSG galv steel, min 2-1/2 in. deep by 1-5/8 in. wide with 3/8 in. folded back return flange legs. 2A. Steel Studs — (Not Shown) — As an alternate to Item 2, For use with Items 1A, 5, 5A, 5B, or 5C. Channel shaped, supplied with cutouts, friction -fitted into floor and ceiling runners and spaced a max 16 in. OC. Studs cut 1/2 in. less than assembly height and staggered flush against the floor runners. Studs fabricated from min No. 20 MSG galv steel, min 2-1/2 in. deep x 1-5/8 in. wide x 3/8 in. folded back return flange legs. 2B. Framing Members* — Steel Studs — (Not Shown) — As an alternate to Item 2, For use with Items 1B and 5 - min 2-1/2 in. deep fabricated from min 0.018 in. thick galv steel, spaced a max of 24 in. OC. Studs to be cut 1/2 in. less than assembly height. 2C. Framing Members* — Steel Studs — (Not Shown) — As an alternate to Item 2, For use with Items 1C and 5 —proprietary channel shaped steel studs, 1-1/4 in. wide by min 2-1/2 in. deep, fabricated from min 0.018 in. thick galv steel, spaced 24 in. OC. Studs cut 1/2 in. less in length than assembly height. 2D. Framing Members* — Steel Studs — (Not Shown) — As an alternate to Item 2, For use with Items 1D and 5 - Channel shaped studs, min. 2-1/2 in. deep, spaced a max of 24 in. OC. Studs to be cut 1/2 in. less than assembly height. 2E. Framing Members* — Steel Studs — (Not Shown) — As an alternate to Item 2, For use with Items 1E and 5 —proprietary channel shaped steel studs, 1-1/4 in. wide by min 2-1/2 in. deep, fabricated from min 0.018 in. thick galv steel, spaced 24 in. OC. Studs cut 1/2 in. less in length than assembly height. 2F. Framing Members* — Steel Studs — As an alternate to Item 2 — For use with Item 1C (3-5/8 in. wide track), channel shaped studs, fabricated from min 25 MSG corrosion-protected steel, 1-1/4 in. wide by 3-5/8 in. deep, spaced a max of 24 in. OC. Studs to be cut 3/8 to 3/4 in. less than assembly height. 2G. Framing Members* — Steel Studs — As an alternate to Item 2, For use with Items 1F and 5 —proprietary channel shaped steel studs, 1-1/4 in. wide by min 3-1/2 in. deep, fabricated from min 0.018 in. thick galv steel, spaced 24 in. OC. Studs cut 1/2 in. less in length than assembly height. 2H. Framing Members* — Steel Studs — (Not Shown) — As an alternate to Item 2, For use with Items 1G and 5 —proprietary channel shaped steel studs, min 2-1/2 in. deep by 1-5/8 in. wide, fabricated from min 25 MSG (0.018 in. min. bare metal thickness), spaced 24 in. OC. Studs cut 1/2 in. less in length than assembly height. 2I. Framing Members* — Steel Studs — (Not Shown) — As an alternate to Item 2, For use with Items 1H and 5 —proprietary channel shaped steel studs, 1-1/4 in. wide by min 2-1/2 in. deep, fabricated from min 0.020 in. thick galv steel, spaced 24 in. OC. Studs cut 1/2 in. less in length than assembly height. When Steel Framing Members* (Item 7) are used: For the 1-hr system, gypsum panels attached vertically to furring channels with 1 in. long Type S-12 screws spaced 12 in. OC. Vertical joints offset min 12 in. from layer on other side of wall. For the 2-hr system, inner layer of gypsum panels attached vertically to furring channels with 1 in. Type S-12 screws spaced 16 in. OC, outer layer with 1-5/8 in. Type S-12 screws spaced 12 in. OC. Inner layer to be applied vertically. Outer layer to be applied vertically with joints offset a minimum 12 in. from inner layer joints. 5A. Gypsum Board* — (Not Shown) — As an alternate to Item 5, may be used as the base layer on one or both sides of wall. For direct attachment only to Items 1A and 2A. - Nom 5/8 in. thick lead backed gypsum panels with beveled, square or tapered edges, applied vertically. Vertical joints centered over studs and staggered min 1 stud cavity on opposite sides of studs. Gypsum board secured to studs with 1-1/4 in. long Type S-12 steel screws spaced 8 in. OC at perimeter and 12 in. OC in the field. 5B. Gypsum Board* — (Not Shown) — As an alternate to Item 5, may be used as the base layer on one or both sides of wall. For direct attachment only to Items 1A and 2A) - Nominal 5/8 in. thick lead backed gypsum panels with beveled, square or tapered edges, applied vertically. Vertical joints centered over studs and staggered min 1 stud cavity on opposite sides of studs. Wallboard secured to studs with 1-1/4 in. long Type S-12 (or #6 by 1-1/4 in. long bugle head fine driller) steel screws spaced 8 in. OC at perimeter and 12 in. OC in the field. 5C. Gypsum Board* — (As an alternate to Item 5 when used as the base layer on one or both sides of wall, For direct attachment only to Items 1A and 2A) — Nom 5/8 in. thick lead backed gypsum panels with beveled, square or tapered edges, applied vertically. Vertical joints centered over studs and staggered min 1 stud cavity on opposite sides of studs. Wallboard secured to studs with 1-1/4 in. long Type S-12 steel screws spaced 8 in. OC at perimeter and in the field when applied as the base layer. Lead batten strips required behind vertical joints of lead backed gypsum wallboard and optional at remaining stud locations. Lead batten strips, min 2 in. wide, max 10 ft long with a max thickness of 0.140 in. placed on the face of studs and attached to the stud with two 1 in. long Type S-8 pan head steel screws, one at the top of the strip and one at the bottom of the strip. Lead discs, max 5/16 in. diam by max 0.140 in. thick compression fitted or adhered over the screw heads. Lead batten strips and discs to have a purity of 99.9% meeting the Federal specification QQ-L-201f, Grades "A, B, C or D". Fasteners for face layer gypsum panels (Items 5) when installed over lead backed board to be min 2-1/2 in. Type S-12 bugle head steel screws. 6. Joint Tape and Compound — (Not Shown) — Vinyl or casein, dry or premixed joint compound applied in two coats to joints and screw heads of outer layers. Paper tape, nom 2 in. wide, embedded in first layer of compound over all joints of outer layer panels. Paper tape and joint compound may be omitted when gypsum panels are supplied with a square edge. a. Furring Channels — Formed of No. 25 MSG galv steel. Spaced 24 in. OC perpendicular to studs. Channels secured to studs as described in Item b. Ends of adjoining channels overlapped 6 in. and tied together with double strand of No. 18 AWG galvanized steel wire. Gypsum board attached to furring channels as described in Item 5. 10. Lead Batten Strips — (Not Shown, For Use With Item 5B) — Lead batten strips, 2 in. wide, max 10 ft long with a max thickness of 0.142 in. Strips placed on the face of studs and attached to the stud with two min. 1 in. long min. Type S-8 pan head steel screws, one at the top of the strip and one at the bottom of the strip or with one min. 1 in. long min. Type S-8 pan head steel screw at the top of the strip. Lead batten strips to have a purity of 99.9% meeting the Federal specification QQ-L-201f, Grade "C". Lead batten strips required behind vertical joints of lead backed gypsum wallboard (Item 5B) and optional at remaining stud locations. 11. Lead Tabs — (Not Shown, For Use With Item 5B) — 2 in. wide, 5 in. long with a max thickness of 0.142 in. Tabs friction-fit around front face of stud, the stud folded back flange, and the back face of the stud. Tabs required at each location where a screw (that secures the gypsum boards, Item 5B) will penetrate the steel stud. Lead tabs to have a purity of 99.9% meeting the Federal specification QQ-L-201f, Grade "C". Lead tabs may be held in place with standard adhesive tape if necessary. 12. Wall and Partition Facings and Accessories* — (Optional, Not Shown) — For use with Item 5 only — Nominal 1/2 in. thick, 4 ft wide panels, for optional use as an additional layer on one or both sides of the assembly. Panels attached in accordance with manufacturer's recommendations. 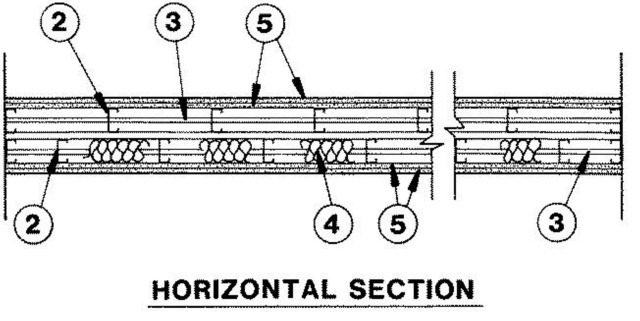 When the QR-500 or QR-510 panel is installed between the steel framing and the UL Classified gypsum board, the required UL Classified gypsum board layer(s) is/are to be installed as indicated as to fastener type and spacing, except that the required fastener length shall be increased by a minimum of 1/2 in. Not evaluated or intended as a substitute for the required layer(s) of UL Classified Gypsum Board.